Exfoliate your lips before application. Apply directly and the lipstick will leave a soft sheen finish. It will become matte in a while, but you can always lightly pat with a tissue for an instant matte look. ISONONYL ISONONANOATE, RICINUS COMMUNIS (CASTOR) SEED OIL, CETYL ETHYLHEXANOATE, KAOLIN, ALUMINUM STARCH OCTENYLSUCCINATE, CANDELILLA CERA/ EUPHORBIA CERIFERA (CANDELILLA) WAX/ CIRE DE CANDELILLA, ETHYLHEXYL PALMITATE, POLYETHYLENE, CERESIN, AQUA/WATER/EAU, SYNTHETIC FLUORPHLOGOPITE, CALCIUM ALUMINUM BOROSILICATE, COPERNICIA CERIFERA CERA/COPERNICIA CERIFERA (CARNAUBA) WAX/CIRE DE CARNAUBA, CAPRYLYL GLYCOL, PARFUM/FRAGRANCE, HDI/TRIMETHYLOL HEXYLLACTONE CROSSPOLYMER, SILICA, TOCOPHEROL, AMETHYST POWDER, DIAMOND POWDER, RUBY POWDER, SAPPHIRE POWDER, TIN OXIDE. [May Contain/Peut Contenir/+/-: MICA, TITANIUM DIOXIDE (CI 77891), IRON OXIDES (CI 77491, CI 77492, CI 77499), D&C RED NO. 7 CALCIUM LAKE (CI 15850), FD&C YELLOW NO. 6 ALUMINUM LAKE (CI 15985), D&C RED NO. 6 BARIUM LAKE (CI 15850), FD&C YELLOW NO. 5 ALUMINUM LAKE (CI 19140), D&C RED NO. 27 ALUMINUM LAKE (CI 45410), CARMINE (CI 75470), D&C RED NO. 33 ALUMINUM LAKE (CI 17200), FD&C BLUE NO. 1 ALUMINUM LAKE (CI 42090)]. It's been a long while since I tried any matte lipsticks because I often find them drying.. as if my lips are not dry enough. However, it's Kate Moss, who can resist that?! The packaging comes in a cool matte red packaging sign by the supermodel. 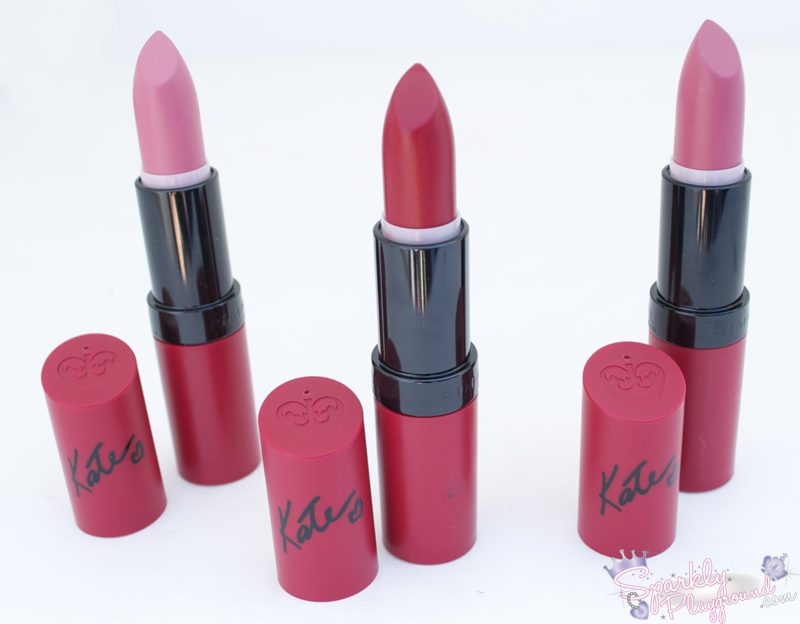 It comes with a great shade range suitable for many woman. I was extremely impressed from the swatches because it was very pigmented and was true to the bullet. However the expectations did not keep up as the time passes by. The colour stays for about 3-4 hours for me but the dryness kicks in within 1-2 hours. I tested this out when I was out with my girlfriends - we're a chattery bunch and I needed to reapply every hour. 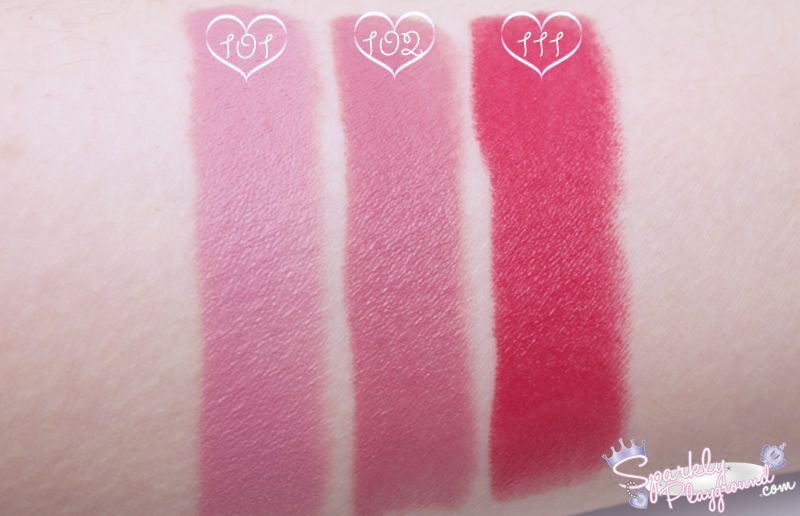 It glides smoothly on the lips, I couldn't believe I was actually applying on matte lipsticks. Shocked at how it feels, feels creamy at first (only), eventually, it felt dry and my lips began to crack with lines! If I applied lip blam beforehand, it does help a bit. Good thing though - I didn't find it staining my lips and it doesn't bleed. Overall, somewhat high maintenance as I needed to check the mirror constantly to make sure I'm not cracking. Last note - I did find that I had less of a cracking/drying problem with shade #111.